The MW802 is a compact portable meter with faster micro processor. 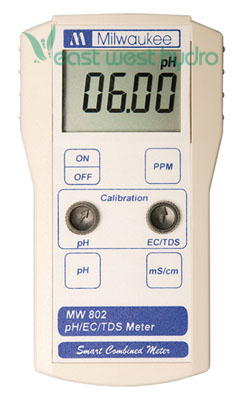 This meter allows you to measure pH, EC and TDS with just one instrument and one single probe! This easier and faster to calibrate portable meter has a smaller, ergonomic and lighter case design. Also has 100% larger and easier to read LED Display and long battery life. It calibrates manually in pH, Conductivity and TDS. Range: 0.00 to 14.00 pH, 0 - 4000 ppm, 0.00 - 6.00 mS/cm, accuracy of ±0.20 pH and ±2% full scale for EC and TDS.The MW802 is a compact portable meter with faster micro processor. This meter allows you to measure pH, EC and TDS with just one instrument and one single probe! This easier and faster to calibrate portable meter has a smaller, ergonomic and lighter case design. Also has 100% larger and easier to read LED Display and long battery life. It calibrates manually in pH, Conductivity and TDS. Range: 0.00 to 14.00 pH, 0 - 4000 ppm, 0.00 - 6.00 mS/cm, accuracy of +/-0.20 pH and +/-2% full scale for EC and TDS. Supplied with a MA850 combination electrode, 9v battery, 20ml packet buffer solution of pH 7.01, 1500 ppm and 1413 !S/cm. Dimensions: 9.7in. × 2.1in. × 1.9in.